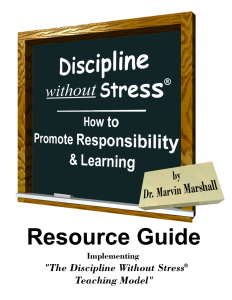 This module explains the Discipline Without Stress model in detail. Curriculum, instruction, classroom management, and discipline are clearly differentiated and how important it is to determine in which of the four areas a problem originates. The module concludes with a reflection piece about the importance of implementing the three practices of the teaching and parenting models in order for the discipline phase to be successful. The printable Resource Guide is not essential for this program; however, if you are a classroom teacher, you will find the return on your investment extremely worthwhile because the guide contains a number of forms you may want to duplicate.